Why would anyone want to know how to make garlic powder at home? Because it’s so easy and you never have to wonder about the quality of your ingredients. If you eat primarily organic, you’ve no probably discovered how expensive organic spices and herbs are at the grocery store. And that’s if you can find them at all! Now, some foodies like to sneer at the use of garlic powder, pointing out that dried spices don’t have the potency and flavor of the fresh stuff. To some extent, they’re right — but there are times when minced garlic just won’t work. Garlic burns quickly in high heat, and it’s dangerous to store raw, minced garlic (.pdf). Well, I could go on… but the point is there are times when garlic powder is preferable. It’s a busy cook’s friend, too, delivering garlic flavor when you’re just too busy to get out the chef’s knife. And once you know how to make it yourself, you’ll never toss out a sprouting head of garlic again. I made my first batch of homemade garlic powder earlier this winter when we were in the midst of a severe snowstorm, and I discovered I was just about out of the store-bought stuff. My son had asked me to make a batch of homemade bagels, and he loves the garlic-flavored ones, so I had to improvise. Once I discovered how easy it is to make, I decided I’d never buy it again. Before you get started, check out this video for a speedy way to peel garlic cloves all at once in less than 10 seconds. If you aren’t a fan of turning on the oven just to make garlic powder, you can also simply pop a tray of sliced cloves into the oven after you’re done cooking dinner. Just turn off the heat first, and be sure to check the garlic more often. You may have to remove individual slices if they begin to dry faster than others. Here’s what it should look like when you’re done. Let them cool and whir them in your food processor or high-powered blender and, presto, you’ve got Homemade Garlic Powder! Homemade garlic powder allows you to control the quality of the ingredients, and it's so easy to make! Preheat the oven to 150° F (65° C). Line a baking sheet with parchment paper if desired. Do NOT grease. Separate the garlic cloves and peel them. Slice each clove into uniform, thin slices. Scatter on the baking sheet, making sure the slices don't overlap. 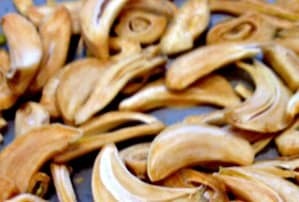 Let the cloves cool completely then place them in your blender or food processor and whir until completely powdered. Wait 5 minutes or so after processing for the powder to settle then transfer to an air-tight container. Will this work to make onion powder too?